The salmon louse (Lepeophtheirus salmonis) is an ectoparasitic copepod feeding on skin, mucous and blood from salmonid hosts. Recently it was shown that L. salmonis infections in farmed fish induce epizootics in wild fish [1,2]. 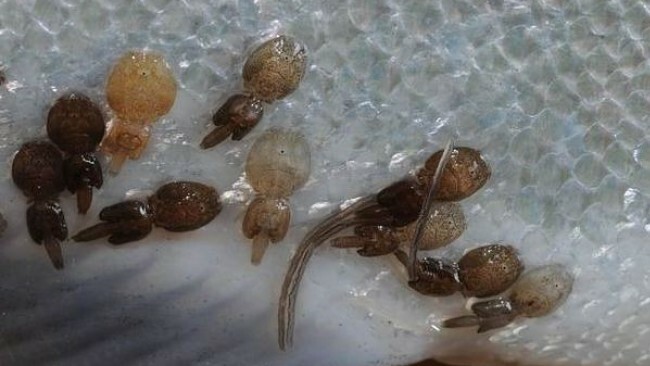 The life cycle of L.salmonis consists of 8 developmental stages separated by ecdysis [3,4] and after the final molt, females develop into mature adults that continuously produce eggs for life. The first free-living larvae (naupli I) hatch directly from egg-strings attached to adult females and all three larval stages (naupli I, naupli II and the infectious copepidid stage) can be transported by the ocean currents over large distances depending on hydrographical conditions . After host settlement the infectious copepodids stage molt into chalimus. The two chalimus stages, all separated by molting, are anchored to the host by a frontal filament , which restricts the feeding area. However, in the succeeding pre-ad I and -II and adult stages the salmon louse can move unrestricted on the host surface resulting in increased virulence . All RNA-seq data for each ENSEMBL-transcript as shown in the Genome Browser track. TMM/CPM normalized in CSV format.